If you can imagine a city of wannapreneurs – a place where it feels like everyone has just jumped out of the starting gates and are in the race to get to the finishing line, and whoever gets their first wins the million-dollar prize money – and that’s not fiction, that’s reality! Look at the cyber-security companies that have come out of Israel – Checkpoint, Imperva, Cyber-Ark, Trusteer, which was sold to IBM, Tufin, plus many have R&D offices in Israel such as Akamai, IBM Security, Raytheon and RSA. What happens in Israel is what happens when you throw a stone in a pond and it creates a ripple effect, a chain reaction. For many of those privileged and talented enough to have worked at Imperva, they have gone onto start up their own brilliant innovative cyber-security companies, many of which have been backed by the original founders of Imperva, including the true greats Shlomo Kramer and Amichai Shulman, who have both helped to spawn many successful start-ups. 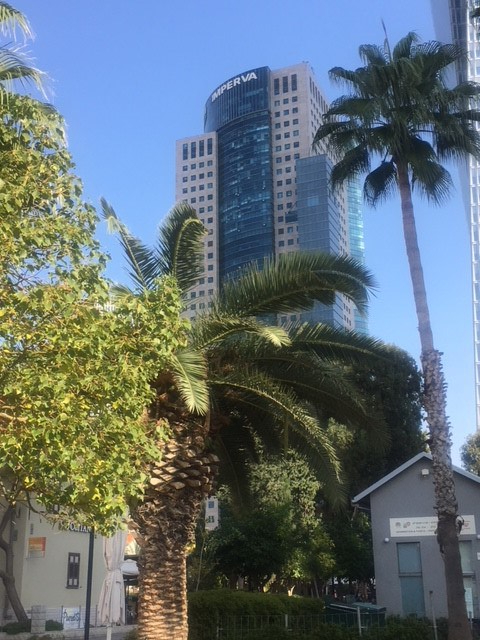 Amichai, who is definitely one of the loveliest and brightest men I know, took the time to take us down Rothschild Boulevard where all the start-up companies hang-out of the most beautiful restored Bauhaus buildings. Each compete to be funkier and more fun than the next and are jammed packed with eager start-ups bursting with yet another brilliant solution that will hopefully solve the latest cyber-security threat. The start-ups sit side by side the venture capitalists and angel investors – who incubate, nurture, counsel and invest in the new guys on the block. It’s what Amichai is now doing after his 15 years building Imperva, now one of the most successful companies in data security and DDoS protection. He has begun to invest in many incredibly innovative and needed solutions, as well as mentoring and lecturing, which seems to be the way it goes in Israel. The idea of collaboration and helping one another is key to why Israel is so successful in cyber-security – the older, successful generation go on to help and support the younger generation. The education system is very much geared towards encouraging kids to go into cyber-security, too. I met a friend over dinner whose son at 14 had just started a boarding school that specialises in computing and cyber – can you imagine that here in the UK? He is obsessed with computing, coding and hacking, so now he can do it safely and responsibly in the confines of a centre of excellence. From these sorts of schools of excellence, they all then are conscripted into the military for a minimum of two years, which is where – if they have the aptitude – they are picked for the 8200 intelligence unit. Ingeniously, this whole system helps sort out any skills shortage problem they may have because they are encouraging the kids from a young age to consider cyber as their career choice. Interestingly, it’s only after military service do they then go onto University, and even then they have multiple Universities of excellence for cyber-security for undergraduates to choose from such as Ben Gurion University, Be-er Sheba. During the press tour, we had six journalists from The Times, the New Statesman, SC magazine, Dark Reading, TechTarget and Bloomberg and were privy to a lunchtime discussion about why Israel is a cyber-security hub. We heard from Ofer Schriber, YL Ventures; David Mimran, the CTO of Ben Gurion University, Be-er Sheba; Nir Lempert, CEO of MER Group and a Deputy Commander of the 8200 Unit; Matan Or-El from Panorays and Roi Yarom Head of Policy Planning for the Israeli National Cyber-Security Bureau – here we saw the real professionalism and passion, the inter-relationships and camaraderie. From this meeting I learnt, too, that the Government has a huge part to play in promoting and nurturing cyber-security in Israel; they have numerous schemes and initiatives to develop this area, plus they send lots of companies of delegations around the world to form partnerships. In fact, another of our clients IRONSCALES were away for part of the week on a funded trip by the Government on a trade mission to Tokyo, where they returned delighted that they had actually closed real business and made some incredible partnerships. Another very interesting and worthwhile lesson to learn from the Israelis! Like the rest of us, they do have their fair share of the cyber-skills shortage, but nothing like we see here in the UK or the US. The issue was more that everyone had a burning desire to stay only for a few years at a start-up and then be the founder of the next cyber-security start-up – so the same old retention issue that we’re all so used to seeing on our own turf. The other remarkable difference about why I think Israeli companies do so well is the fact that everything is so close. Literally, where we spent most of our week, you could walk to every meeting, pop in to the folks next door, meet in one of the many coffee shops or cute, boho chic bars to catch up. Actually, in Israel I’m beginning to think everyone knows everyone else. Each time I mentioned someone they seemed to know them or were happy to make an introduction – everyone seems to be running in the race together – and if you trip up, or need a helping hand they are truly there for each other, to support, mentor and share where they can. I genuinely got the feeling they were in this fight to beat cyber-security threats together.